This web page system contains a number of unique items that you will find little information elsewhere on the web. I would like to draw your attention to some of these! The first is the Quadruplex Park page. I am one of many people who collect old broadcast VTR's, cameras, and other televison broadcasting electronic systems. Here, you will find info on many old VTR's, cameras, film chains, switchers, terminal equipment, etc. There is also a page that discusses videotape system theory, and standards. Finally, take a 'tour' of my 'museum'! See what it's like to move 45,000 pounds of electronic equipment across the country on the Nevada move page! Read about the construction of my new home, featuring many accomodations for antique VTR's, and the 3 (now 4) lions as neighbors! Learn about the fascinating world of Broadcast Engineering on the Broadcast Engineering page. There is information here for bothe the curious and the professional. One feature here is the story of the Digital TV sign-on of KNPB TV! There is also a memorial page for my good friend, Hobbs the liger. Speaking of lions, ever wonder what it's like to travel in Lion country? Read all about it in my Africa Trip Journal. This journal chronicles in detail my trip to Tanzania in February, 1999 to see lions in the wild. I can now safely say that there is no better place in the entire world to visit. I had numerous 'audiences' with the 'King of Beasts' as well as many other animals, people, places and things! Over 170 pictures accompany the web version of the Journal! Are you interested in the pipe organ? if you are, the 'King of instruments' page is for you. There is also a page of links to other information about the Pipe Organ. Information on instruments and concerts in the Reno, NV area to follow shortly! I am an active amateur (ham) radio operator, with my primary interest being VHF/UHF and Microwave weak signal operating. The NS9E VHF contesting page givs lots of information on VHF contesting and weak signal work. There is also an archive of record VHF contest scores for most events, the only one on the internet.I'm a bit behind on the records page, but hope to catch up soon. Another ham radio activity I enjoy is Field Day. I have run a field day team for 7 years now, and have accumulated a lot of 'experience'! Find useful materials to enhance your field day operation! There is also a field day record score archive on this page. Last, but not least, if you have always wondered what being 'born again' is all about, visit the 'King of Kings' page. You'll be glad you did! What do you think? Email me at the address on the bottom of the page! King of Kings. A page about Christian things. King of Beasts - The African Lion Page. A page for lion lovers. The Hobbs the liger memorial page. My life with a 900 pound big cat! Africa Trip Journal. An account of travel in Lion country! New home Details the constuction project for my new home. Profusely illustrated! King of Instruments - The Pipe Organ Page. A page for fans of the pipe organ. Quadruplex Park. Where the Broadcast Dinosaurs live! Nevada Move Journal How all that equipment made it across the country! Broadcast Engineering. A list of resources. NS9E VHF Contesting page. For Radio Amateurs into VHF contesting. NS9E Field Day page. 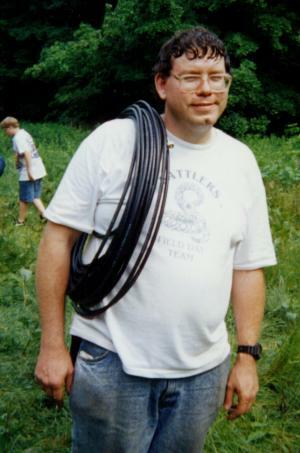 For Radio Amateurs who participate in field day. 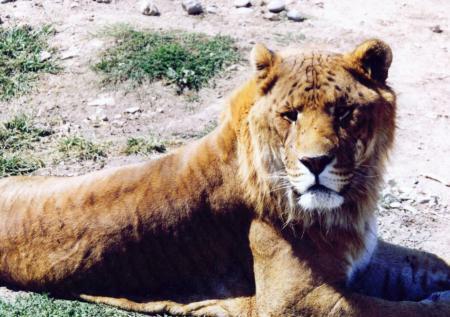 Even before I moved to Reno, I was aware that their zoo had a very unusual big cat-- a liger. A liger is a cross between a male African lion and a tiger. They tend to grow very large, and are in fact the largest of the living big cats. I had not been living in Reno for six days, and I had already met this magnificent cat. Little did I know that I would soon be caring for this cat, and I would be best friends with him to boot! 'Hobbs', as this liger was named, was the star attraction of Reno's Sierra Safari Zoo. He was an absolute joy to work with. Since Hobbs had 'adopted' me to be one of his 'special humans', he would do all sorts of interesting things when I was around. Above all, he just wanted me to be with him as much as possible. All the zookeepers knew 'the look' Hobbs would get if either I or his other 'adopted human' were around! Hobbs taught me valuable things about deep friendships. Besides playing together and playing tricks on each other, we also enjoyed just being with each other. Most people do not realize this, but big cats are among the most peaceful of all animals. But unfortunately, all living things must grow old and die. ligers are no exception. So after a long life of nearly perfect health (just a few months short of the typical 15 year lifespan of a liger), we the zoo staff were horrified to learn Hobbs would soon die of liver problems. Lucky for him, he was not sick for very long, and died very peacefully with his best friends by his immense side. Hobbs was in 'liger heaven'. But we are all still here, with liger-sized holes ripped in our hearts. (It is said that Hobbs is carrying pieces of our hearts with him, to remind him we will someday be with him again!) To this end, I have created a memorial page for my very special friend. You can view it here. For many years, I have had three wonderful cats. 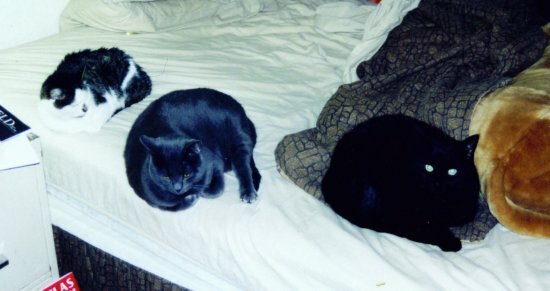 Acquired in July of 1995, 'Cat' (above, far right) was my first cat. He is outgoing, affectionate, and loves to be held, almost to the point of smothering. 'Freeway' (above, middle) was named as such because he was literally rescued on the freeway in July of 2002 as an older kitten. He is totally devoted to me, but is shy with anyone else. The third cat, 'CC' was obtained in January of 1997 as a companion to 'Cat', thus the name 'CC'. CC was always a lady, but despite being half the size of the two male cats, managed to keep them in line. Every morning and every night, she would come up by my pillow, looking for aome attention. Sometimes, she would stay there and just purr for an hour or more. An ex-feral, CC never liked being handled, which made her a challenging cat to work with. Her feral heritage also left her with small internal organs, which proved to be her undoing. Starting in the winter of 2005, she started having some problems with her kidneys. Giving her extra attention and a special diet worked fine for her until the summer of 2006, when she had another bout with kidney problems. With a quicker response and better care, she recovered from this condition rather nicely. But in the closing days of 2006, she began to really go downhill. At first it looked like she had some sort of enteritis. But when it became nearly impossible to keep her hydrated and eating, it was discovered that she had a very rapidly developing cancer. Knowing that she was also figithing the enteritis (which might have been caused by the cancer), I had to make the excruciatingly tough decision to send her to 'Aslan's Country'. So, on the afternoon of January 19th, 2007, CC went off to that far-off place where there is no disease or death. Despite the harsh medical treatments, CC did her very best to remain my friend right up to the end. Now, I know that she is longing for me to join her in 'Aslan's Country'. CC my friend, I will never forget you!